Mike and Annamarie Campisi tied the knot on July 16 and then set off on an unusual honeymoon. They didn’t fly to Hawaii, sail off to Jamaica or drive up to some mountain cabin hideaway. Instead, they went to Thailand … to work. The Campisis spent a week with several other service-minded volunteers on a Fuller Center for Housing Global Builders mission to build a simple, decent home for a family in the small community of Lampang in northern Thailand. 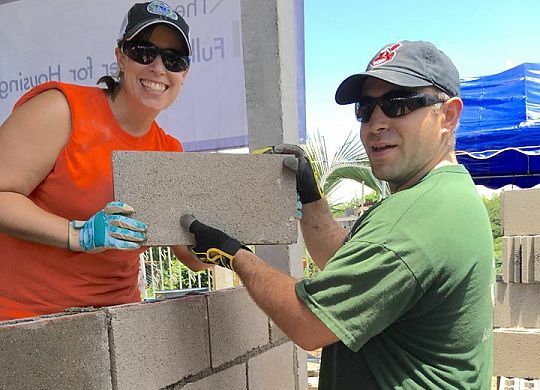 “My first thought was, oh boy, I don’t know about that,” said Annamarie, noting that while she has always been service-minded, she had never traveled internationally. Mike, however, talked her into it. As the couple planned their wedding, they continued to consider their options for a Global Builders honeymoon. They talked with Fuller Center Director of International Field Operations Ryan Iafigliola, who attended the same high school as Mike and whose older brother Brett was Mike’s friend. Iafigliola told them there was a group headed for Thailand, one of The Fuller Center’s newest Global Builders destinations, just two days after their wedding. The more they learned about the trip, the more determined they became to have just such an alternative honeymoon. Annamarie is thankful that her first international travel experience came through The Fuller Center’s Global Builders program, which not only provides families with eager volunteers to help them build their homes but also offers those volunteers an opportunity to experience the world and authentic cultures off the beaten tourist path. Is it an experience every newlywed couple should try? While it might not be the perfect honeymoon for every couple, Annamarie insists it was perfect for her and her new husband. As they were leaving Thailand, they were making plans for future Global Builders experiences before they even boarded the flight home. They even asked Thailand site leader Boots Walker when they could bring their future children.